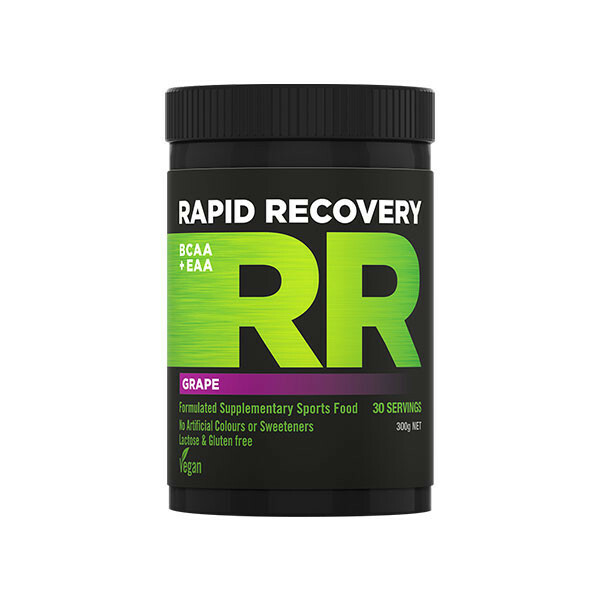 Rapid Recovery has been designed to help you recover from your intense training sessions. Used before, during, or after exercise, Rapid Recovery may help spare muscle tissue breakdown (catabolism) and assist in supporting muscle growth and aiding recovery. Rapid Recovery contains all of the Essential Amino Acids including the Branched Chain Amino Acids. Essential Amino Acids cannot be synthesized by the body and must be supplied through our diet. They are essentially the building blocks of life and must be consumed for protein synthesis to occur. Rapid Recovery contains 5550 mg of Branched Chain Amino Acids in the proven 2:1:1 ratio which enables the optimal amount of leucine to be available for protein metabolism as well as creating a muscle sparing effect. This formula provides the 9 Essential Amino Acids in amounts similar to skeletal muscle tissue and this increase in amino acid availability, creates a positive net muscle protein balance. Which means …. you're more ANABOLIC. L-Leucine: Is important for protein synthesis and many metabolic functions. Leucine contributes to the regulation of blood-sugar levels, growth and repair of muscle tissue and growth hormone production. Leucine also prevents the breakdown of muscle proteins (catabolism). L-Isoleucine: Can assist in wound healing, regulating blood sugar and energy levels and also stimulating immune function. L-Valine: Can help to reduce sleeplessness and improve cognitive function and also regulate the immune system. L-Lysine: Is especially important to help the body’s own natural ability to manufacture antibodies and hormones. It is also essential for building muscle protein and absorbing calcium. L-Threonine: The body converts threonine into the amino acids glycine, which calms the central nervous system, and serine, which can stimulate it. L-Threonine is often used to support the production of connective tissue. L-Methionine: Can support healthy liver function and also can enhance exercise recovery and cardiovascular health. L-Phenylalanine: Is an essential amino acid that is a precursor to key neurotransmitters such as dopamine and norepinephrine which can have an energizing and cognitive-enhancing effect on the body. L-Histidine: Plays a key role in the manufacture of red and white blood cells. It also helps in the removal of excess heavy metals from the body. Histidine helps in the production of gastric juices in the stomach that mat help improve digestion and improve gut health. L-Tryptophan: is the precursor to Serotonin which acts as a natural mood regulator, offers cognitive enhancement and can help reduce inflammation. It has also been shown to fight anxiety and help alleviate symptoms of depression. Flavour, Food Acid (E330), Stevia. Mix one serve with 175mL of water Consume during training or daily at any time. Made on a production line that also produces products containing Milk, Gluten, Soy, Egg, Nuts, and Seeds.